Tonight, I’ve spent the evening working a new little project of mine. It’s quite small and simple, but it could just change your life. I’ll post some more about it soon, and perhaps create a project page. For the time being, please feel free to download from here and use in whatever way you feel like. There’s no formal documentation at the moment, and eventually I’ll get around to writing some good instructions and putting some kind of decent description of how to use it. I’m also planning to release it under some GPL or BSD licence, but I’ll get to that in good time. There’s a good example file in the archive called “index.php”, but this should probably not be deployed with your website! The other 3 files (phptabs.js, phptabs.inc.php and phptabs.css) are all needed and should be deployed. 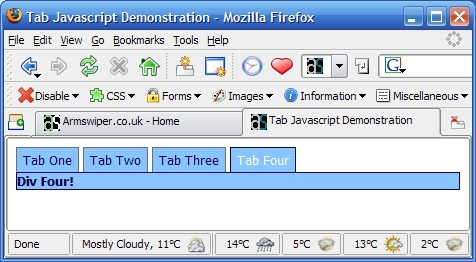 You should also customise phptabs.css. Please feel free to poke around and use it however you wish. If you find any bugs, have comments, would like something changed, have improved it in some way, then drop me an email – it would be nice to see how useful other people find it!